Wall signs establish the look of a business, and create a distinct professional image. They are an impressive way to identify your facility and brand your business. Since they are part of the building, wall signs convey a sense of longevity and stability that generates customer trust. ABC Signs can assist you with wall signs to serve a variety of purposes and needs. 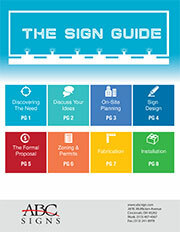 ABC Signs has created effective wall signs for a broad range of customers. We will work with you every step of the way, from the initial design to the final installation of your signs. Let us get to work on your sign – please call (513) 407-4367 or email us today!